How can I buy Dexilant 60 mg online? It is easy to purchase Dexilant online from YouDrugstore. 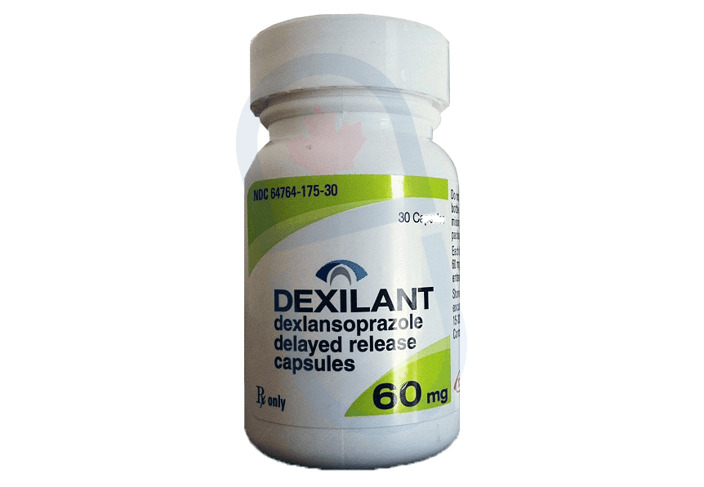 All you have to do is register on our website and send us your prescription for Dexilant 60 mg. To speed up the process you can ask your doctor to fax us your prescription directly. YouDrugstore is an online Canadian pharmacy, so when you buy from us you pay the same price they pay in Canada. Once we receive all the necessary information our team of experienced pharmacy technicians and physicians will review your order. Then we ship your prescription right to your door at an affordable shipping rate. In fact, all orders over $100 come with free shipping. Order from YouDrugstore today and help treat GERD. What is GERD, and what causes it? GERD stands for gastroesophageal reflux disease. It is also known more simply as acid reflux disease. GERD is a disease in which you suffer from a constant feeling of heartburn due to damage in your esophagus. This damage is a result of stomach acid coming up from your stomach and burning away the protective mucous membrane that lines your esophagus. The symptoms of GERD include heartburn, chest pain, nausea, coughing, regurgitation, difficulty or pain when swallowing, sore throat, and excessive saliva. If GERD is severe or left untreated it can cause irreparable damage, ulcers, and narrowing of the esophagus. Order Dexilant 60 mg today from YouDrugstore and start treating GERD as soon as possible. Why is Dexilant 60 mg used to treat GERD, and what are there side effects? Dexilant is the exact same medication as Kapidex. The name change to Dexilant was simply to help distinguish it from other medications. Your doctor has prescribed Dexilant 60 mg because it contains what they call a proton pump inhibitor. A proton pump inhibitor is a drug that effectively suppresses stomach acid production in your body. This stops your stomach acid from overflowing and doing any more harm to your esophagus, giving your body a chance to heal the damage that has been caused. Side effects of taking Dexilant 60 mg are considered very uncommon, but if they do happen then you may experience diarrhea, gas, vomiting, and nausea. Tell your doctor if your symptoms or side effects persist or worsen when taking Dexilant 60 mg. If you experience any other symptoms not listed here speak to your doctor. When should you take Dexilant 60 mg? Always follow your doctor's instructions when taking Dexilant 60 mg. Typically, he or she will ask you to take a single Dexilant 60 mg capsule daily for about 4 weeks. You can choose to take Dexilant 60 mg capsules with or without food. If Dexilant 60 mg causes you any stomach upset, simply try taking it with food. If you have a problem swallowing the capsule whole you can open the capsule and spread the medication onto a spoonful of applesauce or peanut butter. Swallow the mixture immediately, do not save it to use later. Try not to chew the medication, and ensure that it gets down into your stomach. Drink a glass of water with the medication to help it down. If you have any questions ask your doctor. Who might receive a prescription for Dexilant 60 mg from their doctor? Most people can use Dexilant 60 mg without any issues. However, the safety of Dexilant 60 mg has not been tested on people younger than 18 years old. You can still be prescribed Dexilant 60 mg by your doctor if you are pregnant, but be sure to tell him or her you are pregnant before you take Dexilant 60 mg capsules. You cannot take Dexilant 60 mg if you are allergic to it or any of its ingredients. Ask your doctor if you have any concerns.